First off, I’m not sure I’m supposed to be upfront about what I’m doing. That said, I’ll explain, dear reader. It’s a blog game, thought up by this fine lady. I need to work five words into an entry. Fortunately, I’ve got a leg up on this because of our fine nephew, Christopher. I met Christopher when he was about 4. When he was 5, he learned a very funny joke – “funny” in a five-year-old’s mind – and it went like this, “Constantinople is a very long word. Can you spell it?” And people would try and not be able to spell “Constantinople.” But the correct answer is “i-t.” Get it? Can you spell “it”? Oh, Christopher would laugh and laugh. The problem is, he is now 13, and this is still the one joke he tells. And we all have heard it many times. And so we always groan. Whether that is the proper etiquette or not, I’m not entirely sure. But it’s what we do. Those who read the blog often know that I’m a stickler for accuracy. [OCD is the description I’ve given my condition, knowing that such total disregard for true sufferers of the disease might cause them to wish a hobgoblin on me.] Combine my need for accuracy for my drugging myself through college, and you end up with me needing to check out wikipedia in order to find out what “postmodern” exactly means. And, as often occurs while I’m perusing wikipedia, I stumble across my favorite definition/use. “Weird for the sake of [being] weird.” Now that’s my kind of philosophical outlook. 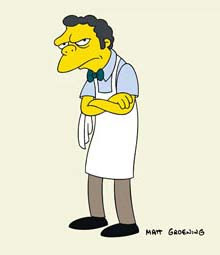 Thanks Moe Szyslak! Care to know the five words I needed to use? Well, I came right out and gave you one – postmodern. The others? First, Constantinople, hobgoblin and etiquette. What do you think?